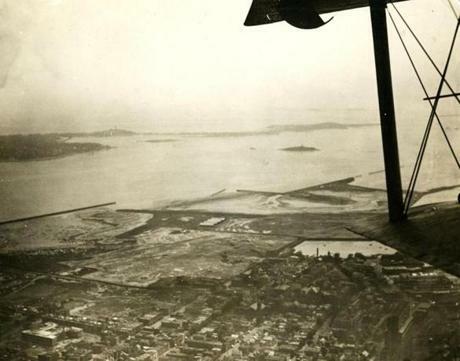 Aug. 9, 1925: A view of Boston Airport and the harbor from the giant Sikorsky all-metal plane "Yorktown" which visited Boston. This type of plane was to be used in the proposed airline routes from Boston to St. Paul-Minneapolis and Boston to Havana. July 1, 1926: The post office at at the Boston Airport did a rush business. 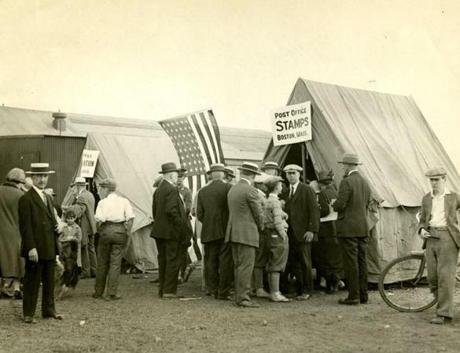 In addition to selling stamps, the airport had just opened its air mail service where besides letters, local businesses could send and receive packages transported by plane. 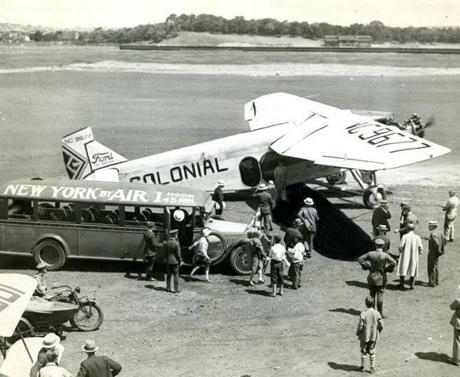 Undated photo: On April 15, 1927, Colonial Air Transport (a predecessor of American Airlines) began passenger service between Boston and New York. The bus picked passengers up at the Hotel Statler in Boston at 9:15 a.m. and took them to the airport. As noted on the roof of the bus, the trip to New York then took 1 hour 45 minutes. 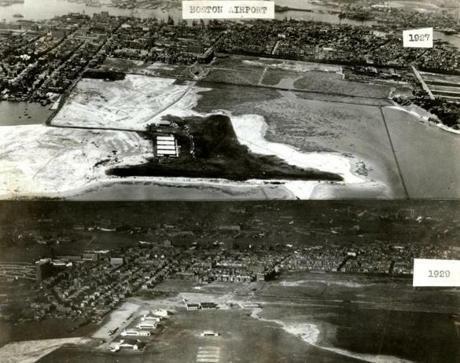 Dec. 15, 1929: An aerial view of the Boston Airport showing the development from 1927 to 1929. 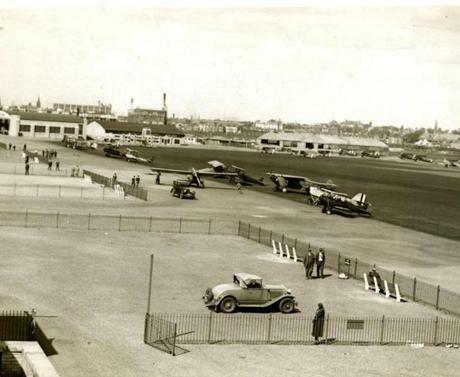 In 1929, the City of Boston took control of the airport with a 20-year lease from the state. Buildings were added, runways were lengthened, and access roads were paved and landscaped. Two hundred acres of land were reclaimed from Boston Harbor. Oct. 5, 1930: A typical day at Boston Airport. 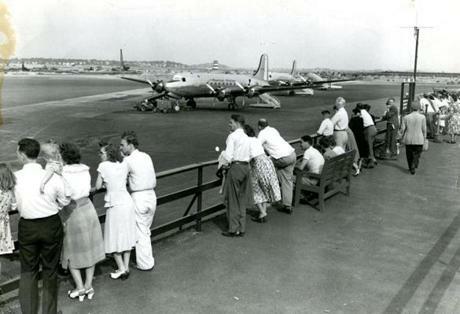 There was always a little group waiting to see the New York passenger plane come in. If some noted person was scheduled to arrive, the crowd grew in size. Aug. 18, 1935: The Massachusetts National Guard ground detail took part in exercises at the Boston Airport. For the field inspection, the men pitched their pup tents in camp formation, and placed their equipment and blankets in front of the tents as the inspecting officers passed by. June 28, 1936: Pilots checked off the United States mail pouches and the passenger luggage as they were stowed away in the baggage compartment under the controls of the American Airlines Condor 159 plane. 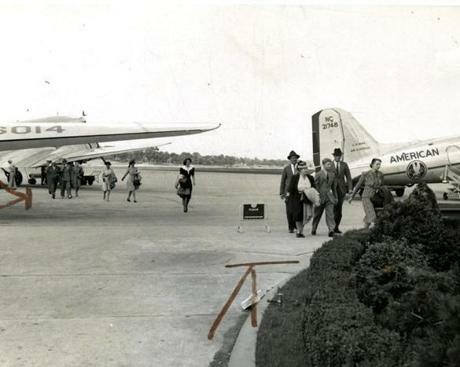 Aug. 19, 1940: Passengers who arrived at Boston Airport walked outside from their plane to the terminal. 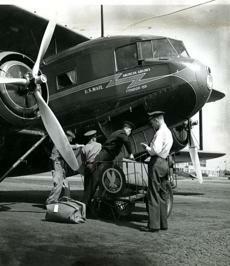 Feb. 19, 1940: A porter unloaded baggage from an incoming American Airlines flight. 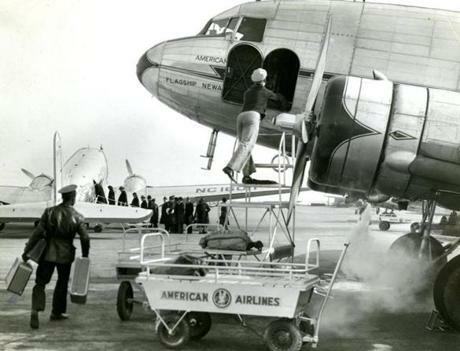 Passenger traffic over routes of American Airlines had set a new record for air traffic in January, when the flagships transported 45,939 passengers an increase of 83.5 percent over January 1939. 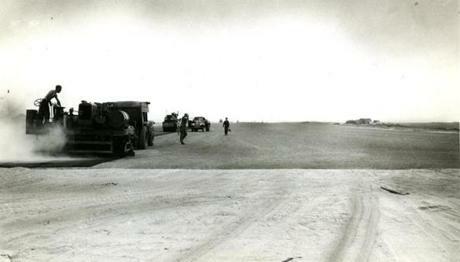 July 7, 1946: The making of runway A and runway B involved trucking in about 1.1 million cubic yards of yellowish gray gravel for fill for the new 7,000-foot runways. Nearly 300 trucks a day piled high with the gravel made the trip from gravel pits in Middleton and Peabody. The airport was renamed General Edward Lawrence Logan Airport in 1943. Aug. 25, 1948: A broad view of the entire airport was gained from the observation promenade atop the Administration Building. The control tower can be seen in mid-field. Here, for just the cost of a dime, people could watch the arrival and departure of aircraft. June 20, 1950: A Northeast plane prepared for takeoff. Northeast Airlines was based in Boston and on Aug. 1, 1972, Northeast merged with Delta Air Lines, which provided Delta with access to the Boston market. 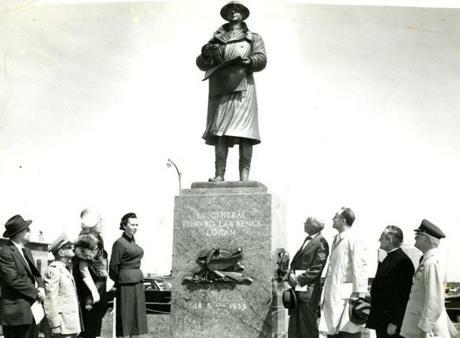 May 20, 1956: The statue of Lieutenant General Edward L. Logan, for whom the the airport was renamed, was dedicated at Logan International Airport. Logan commanded the Ninth Infantry Regiment as a colonel in World War I. He became commander of the Yankee Division in 1923 and in 1928 was promoted to lieutenant general. The 8-foot-high bronze had scenes symbolizing patriotism, justice, faith and fortitude. Joseph A. Coletti, a native of Quincy, was the sculptor.